Taboola is the PUP that uses misleading techniques to prevent removal. Use Reimage to locate malicious components and get rid of them faster than with uninstall instructions. A full system scan blocks virus reappearance and prevents traffic to malicious domains. Official website of Taboola advertising platform. Taboola is a content recommendation network that provides its ads on many popular websites nowadays. 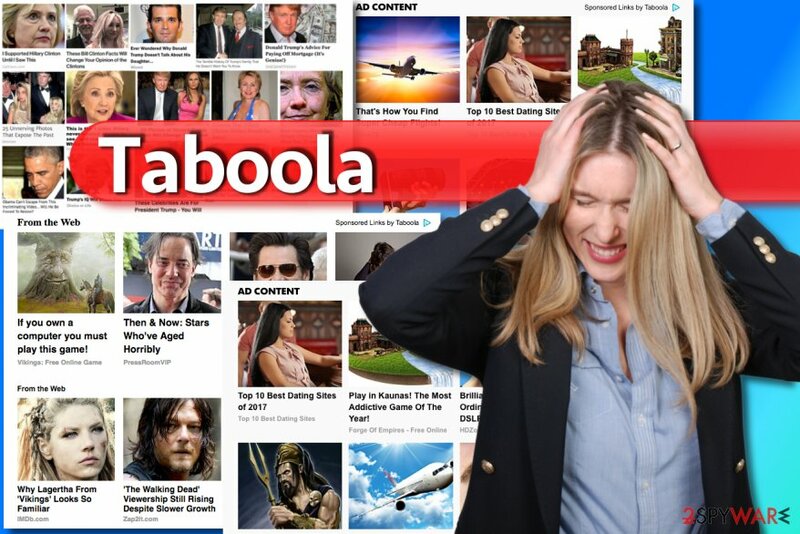 Some of Taboola's publishers are NBC, Aol, The Weather Channel or MSN. However, these ads can be highly annoying because clicking on them usually throws the user to external websites. Besides, you can never be too sure when clicking on them – recently, scammers compromised the ad network to serve malicious ads to computer users across the globe. Internet is an amazing place to learn new things and algorithms used on websites allow us to learn consistently by providing suggestions on what to read next. Unfortunately, Taboola can turns these things around. Although it hardly differs from other content recommendation platforms such as RevContent, Spoutable or Outbrain, users tend to call Taboola ads annoying and often start looking for their removal guidelines. Unfortunately, there is no way to remove Taboola from websites that display them as it is up to the website owner's choice whether to display these ads or not. This content recommendation platform is designed to present the users with sponsored news stories and click-bait celebrity news. It actually places annoying and intrusive ads and articles on web pages when the user browses the web. It is important to know that these ads and articles are part of the website you are visiting. Therefore, attempts to find associated adware in your computer might be unsuccessful. As you probably understood, there is hardly anything to do regarding Taboola removal. You can simply avoid websites that display these ads or simply ignore the ads. Having in mind all of the things we have already discussed, is not surprising why so many people want to block Taboola ads somehow. They often complain that seeing these ads makes their web browsing experience worse with the constant appearance of pushy ads, “Related articles” and “From around the web” news which distract them from finding relevant information on the Internet. Taboola spam is not only annoying; you can never trust where you will end up after clicking on these irritating advertisements or articles it suggests reading. Although the ad network claims to be using strict restrictions for advertisers and prohibiting the use of offensive, threatening, inappropriate, dangerous or scam content, recently the ad network was compromised and clicking on its ads used to redirect victims to a tech support scam page which we will describe later. The only thing that we want to accentuate is that you can never fully trust these ads and click on them without worries. You can never know what hides behind them! Taboola business model is simple: it places eye-catching content to draw users’ attention and make them click on it, in other words, it functions as bait. When the bait servers its purpose and the users click on the ads, Taboola redirect occurs and drops its victims off on some promoted websites. Each of such redirects generates pay-per-click revenue for the developers of this PUP. You should avoid content marked as “Sponsored links by Taboola,” “Content you may like” or “Related articles.” A few exampled of such ads can be seen in the picture below. To sum up, we want to share our opinion with you – we believe that These marketing strategies are a bit pushy, however, when seeking for security and privacy online, you should see these ads the same way you see any online content. Just do not be too trustful and you will be fine. Sadly, it seems that it is not really possible to avoid Taboola ads at all times because some websites simply choose to provide their advertisements willingly. In a recent Facebook update, which was rolled out completely silently, a new feature was added to Facebook apps for iOS and Android – an icon with rocket icon on it. Some news sites were quick to state that the new feature serves users content that looks like “a mixture of Taboola ads and Snapchat's Discover section.” However, the mysterious rocket button quickly disappeared as it was only a test feature. The giant content recommendation platform has recently became a victim of a cyber attack. While the company strives to strictly check reliability of every advertiser, rogue ones managed to push malicious ads via security checks and this way abuse ad network for promotion of deceptive ads. The server 4vxadfcjdgbcmn.ga is asking for your user name and password. The server reports that it is from Suspicious activity detected on your IP address due to harmful virus installed in your computer. Call Toll Free now +1-833-335-1333 for any assistance. Your data is at serious risk. The deceptive message then repeats all problems and issues that the user will run into if he attempts to open Internet browser or restart the computer. It is obvious why the support scammers try to frighten the user not to take these measures because a) opening another browser could help the user find information about this fake “Windows Security” pop-up online, b) restarting the computer would shut down the scary pop-up. However, if you noticed that you see too many ads by this content recommendation network, you might be dealing with an adware program that serves these ads to you. That might be the case why “Taboola virus” term appeared, say Novirus.uk experts. When the virus settles down on the computer, it copies its command file taboola.dll to the Program files and ProgramData folders from which it can then run its processes. In fact, the majority of ad-supported programs or browser hijackers are distributed like that. The good news is that you can always opt out these additional components by adjusting the installation settings appropriately. You have to opt for either “Custom” or “Advanced” installation option when installing new programs, and then you will be provided with a list of optional programs added to your selected one. Deselect the checkboxes next to them to avoid installing them. That is all you need to do to prevent installing unlooked-for additions. If you are one of many users who cannot stand these advertisements, you are probably looking for a clear removal guide. Luckily, we have one prepared for your below. You can remove Taboola using anti-spyware software. If you do not want to see these Taboola articles or ads anymore, and if you are sure that your computer is free of spyware or malware, you can try to solve the issue manually. For that, follow removal instructions given below. However, if you would like to check the security status of your PC, consider installing a reliable security software like Reimage. We recommend using this program because it can detect and remove the latest computer threats and also provide real-time protection. If you have any questions regarding uninstall, please contact our support team. Taboola virus is known to infect exceptionally the Windows OS, but instances of its hijack may occur on other operating systems as well. In case of such an attack, you should act quickly and scan your computer with an antivirus tool. If you do not have one installed, follow the steps below to remove Taboola from your PC manually. Here, look for Taboola or any other recently installed suspicious programs. Trying to remove Taboola from the Mac OS manually may seem overwhelming, thus, we have prepared the following instructions to guide you through this process. Wait until you see Applications folder and look for Taboola or any other suspicious programs on it. Now right click on every of such entries and select Move to Trash. When in the new window, check Delete personal settings and select Reset again to complete Taboola removal. If Taboola virus has infected your PC, it most probably have installed some browser extensions or add-ons to help it deploy ads and news stories on your visited websites. It is absolutely necessary to clean up your browser from such potentially dangerous components. You can do it by going to the Microsoft Edge settings and clicking the “Extensions” catalog. Once these steps are finished, Taboola should be removed from your Microsoft Edge browser. Here, select Taboola and other questionable plugins. Click Remove to delete these entries. Now you will see Reset Firefox to its default state message with Reset Firefox button. Click this button for several times and complete Taboola removal. Taboola-related components may be placed on your browser, thus to clean up your device from this virus completely, you should eliminate any suspicious add-on or browser extension that you find in Google Chrome's “Extensions” list. Here, select Taboola and other malicious plugins and select trash icon to delete these entries. Click Reset to confirm this action and complete Taboola removal. Here, select Extensions and look for Taboola or other suspicious entries. Click on the Uninstall button to get rid each of them. Now you will see a detailed dialog window filled with reset options. All of those options are usually checked, but you can specify which of them you want to reset. Click the Reset button to complete Taboola removal process. ^ Will Smale. Taboola: The internet firm at the forefront of 'click-bait'. BBC News. Up-To-The-Minute News, Breaking News, Video, Audio and Feature Stories. ^ James Temperton. We need to talk about the internet's fake ads problem. WIRED UK. Future Science, Culture & Technology News and Reviews. ^ Yuris Bendiks. 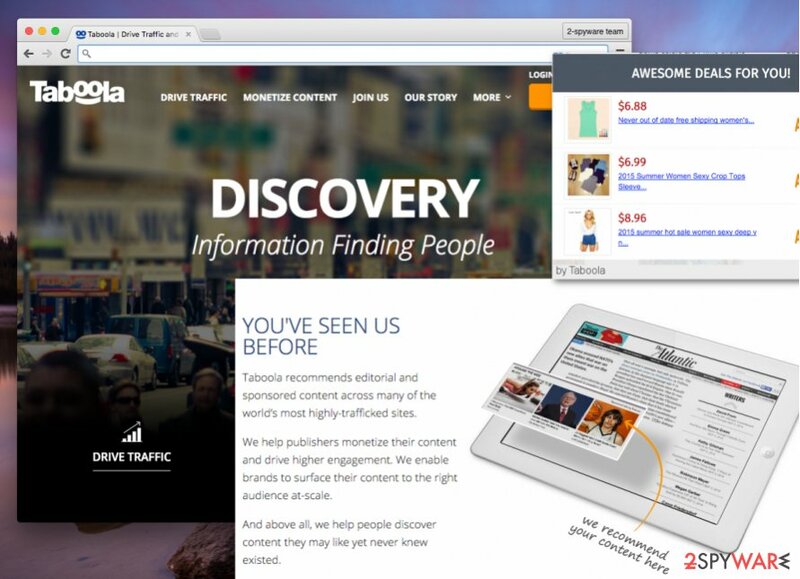 Imagination Case Study: Driving Traffic with Taboola. Imagination. Content Marketing Agency in Chicago. 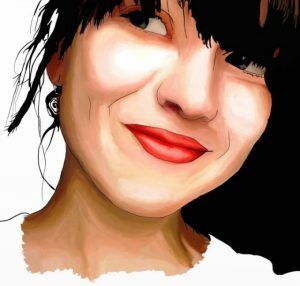 ^ Victoria Woollaston. A mysterious rocket icon has appeared on Facebook's menu bar. WIRED UK. Future Science, Culture & Technology News and Reviews. ^ Jérôme Segura. 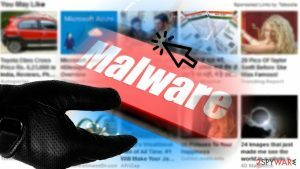 Tech support scammers abuse native ad and content provider Taboola to serve malvertising. Malwarebytes Blog. Security News, Threat Research. ^ What is Adware? - Definition. Kaspersky Internet Security Center | Cyber Security Resource for Tips, Topics & Trends. ^ NoVirus. NoVirus. Malware, Spyware, Security News. This entry was posted on 2019-04-01 at 02:36 and is filed under Adware, Viruses. You can quickly scan the QR code with your mobile device and have Taboola ads manual removal instructions right in your pocket. How did you remove Taboola ads?